Blocks of flats have long been problematic for recycling professionals. Shared bins encourage the idea that recycling is not an individual’s responsibility, bin stores can often be dark unpleasant places with inadequate signage and, for the residents themselves, it’s often an inconvenient chore to trudge to the bin store and dispose of their recycling, especially during the cold dark months of winter. But Surrey Waste Partnership, an umbrella organisation that brings together Surrey County Council and 11 district and borough authorities in the county, may have found a way to combat these problems. Over the last three years it has been working on an initiative that is already making a positive difference to recycling around the county’s flats. A bin store at a block of flats in Surrey. 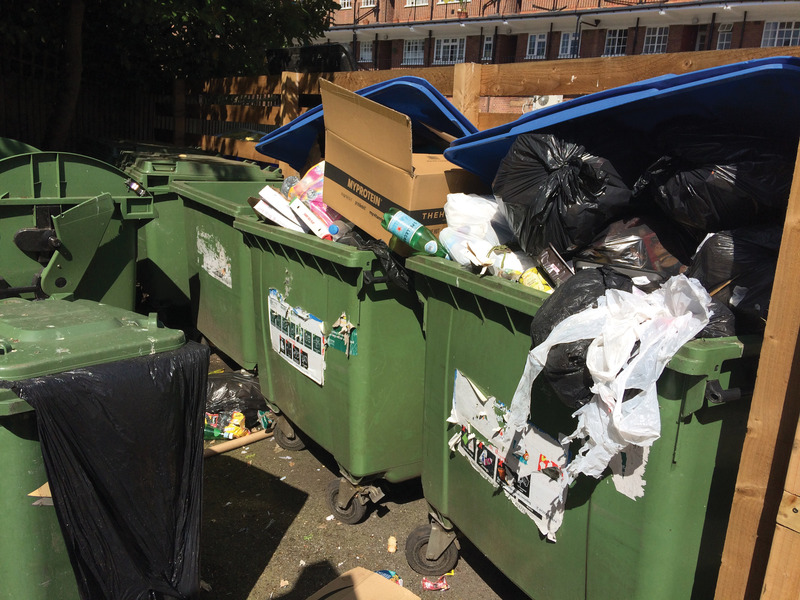 The idea was first mooted in 2015, according to Shelley Holmes, Flats Recycling Manager: “Officers met back then to identify what the key issues relating to recycling in Surrey were. Every council reported that blocks of flats were an issue, so a case was put forward to members to create a dedicated team to work on them. “First of all we met with recycling officers from each council who had in-depth knowledge of difficult areas and behaviours of residents locally and then we agreed which blocks to tackle.” Each district and borough was then worked with in turn, starting in Runnymede. The team spent three weeks monitoring behaviour by looking at the layout of bin stores, how full the bins were, how much contamination each bin had and what the main contaminants were. Using this data they worked out the key issues that needed resolving at each block and began to develop targeted interventions. Some of these interventions involved changes to the infrastructure. New food collection services were introduced and residents supplied with caddies and liners. Modifications were made for dry mixed recycling – to reduce contamination from black bags, old plastic bins with roll top flat lids were replaced with metal bins with restricted apertures and locks. The small number of properties that had no recycling collection at all were provided with a service for the first time. Communication was crucial to the scheme’s success. For new services, a direct mail was sent to residents a month before the start date explaining the changes. For existing services, the primarily pictorial signage in bin stores was updated and stickers, bin tags and branded recycling bags were sent to residents. When the Partnership surveyed residents that had taken part in the scheme, over 80 per cent of those that responded said they intended to use or were already using their new reusable bag.